The release of the Elite Dungeon 3 came after months of waiting in excited anticipation. While the Elite Dungeon content hasn't felt particularly targeted to my style of PvM, the previous two dungeons laid the groundwork for fantastic entry level to high caliber content. They filled in the gaps between God Wars Dungeon 2 and high tier bosses like Telos or Vorago in an interesting, graphically gorgeous and engaging manner. ED1 has a lot of good going for it and I absolutely loved ED2, which you can read my initial thoughts about here. My thoughts on ED3 are mixed - there are parts I'm in love with: breathtaking (literally) graphics, fun mechanics, the least-grindy feeling dungeon of the three, fully immersed lore, huge potential for weapon/gear diversity, and finally a place where mage isn't completely dominant! (Although it's still excellent) On the other hand, I don't know if this is the correct direction to go for releasing arguably best in slot weapons. In order to balance the fact mid to mid-high level content is dropping arguably the most powerful ranged weapon, if not most powerful weapon generally, in the entire game they made the drop rate astronomically rare. In order to balance having such an incredibly high money item as the carrot for doing ED3, the hourly GP absolutely pales in comparison to ED1 and 2, particularly after the ED1 solo drops buff. I was averaging less than 3.5m/hr in loot at ED3, and that's without factoring in supply usage - just gross income. One could very easily make less than 1m/hr in the dungeon as well as there are only a couple drops on the ambassador table worth over 500k. I do think that the fun of this content is a reward in itself, but unless you're either really feeling lucky or want to get the pets/collection really badly, I don't see where the point is in doing this content in terms of moneymaking. Additionally, I am frustrated by Jagex's change to the ambassador. Previously, if the team phased the boss to 500k hp fast enough it skipped the fire spin mechanic, which adds around 1:00-1:30 to the fight. On Reddit Mod Camel posted "I was able to skip it using JMOD cheats. We didn't think players would be able to get those dps levels." Ironically, my team skipped it our very first ambassador kill, and we were also able to skip it extremely easily duo after a bit of practice with rotations - believe a solo skip would've been possible with enough titan specs as well. It's somewhat disheartening to learn how out of touch JMods still sometimes are when it comes to the average DPS output for high level PvMers. As far as gear goes, each of the three combat styles has plusses and minuses. Weapon poison works so Cinderbanes are best in slot for all 3 styles. My team has settled on two melee one magic as the preferred method. Corruption blast, dragon breath and chain really help collect and group minions and vulnerability is very nice for the three bosses. Melee damage absolutely carries at the bosses and quake, hurricane, cleave are the best AoE damage in the game for clearing mobs. We experimented a bit with triple melee, but found giving up on the limitless sigil spec for an ingenuity of the humans vulnerability wasn't worth it. Alternatively you could hybrid melee/mage but I don't think it's worth the effort aside from speed attempts. I don't think ranged is worth it as it has much worse AoE than melee/mage without mechanical chinchompas which are I would argue are too expensive to justify. Also, don't forget a spring cleaner or note paper as the highest value ambassador common drop is a bunch of un-noted heavy blunt salvage. A blood necklace can replace the Amulet of Souls, you'll get a lot of healing from minions. Here's my melee setup - custom fit trimmed masterwork is a huge boon here, as it negates the KO potential you would otherwise have during berserk, and not draining charges is extremely nice. The flanking and rapier switches are totally unnecessary but I use them because I'm used to them. I would highly recommend the Zaros Godsword for its spec if accessible, but honestly camping scythe with vampirism scrimshaw would be totally adequate - I bring a Grimoire for the boss fights only because I own one, but you don't need it at all. The salve amulet (e) is an absolutely massive damage boost against the second boss and the huge number of undead minions in the dungeon - I would highly recommend everyone in the team bringing one. The malevolent legs are there for the undead slayer perk for the second boss, when masterwork is able to be dyed I'll swap it out for a barrows dyed trimmed masterwork legs. Here's my magic setup--don't use tectonic here, the drain rate costs significantly more GP than your average gold/hour. 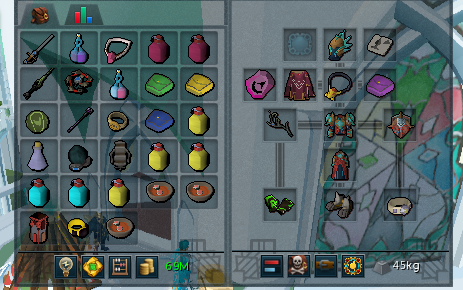 If you can't afford t92 elite tectonic for the no drain rate, Virtus or Anima Core of Seren are adequate substitutes. Additionally, the rune pouches aren't really needed - air, chaos, and soul runes on the normal spell book are completely fine. I bring all the runes because I'm accustomed to spell book swapping and 4taa with blood barrage on minions keeps your health up very nicely. One thing I enjoy about the Elite Dungeons is the way they take advantage of weapon and perk diversity. 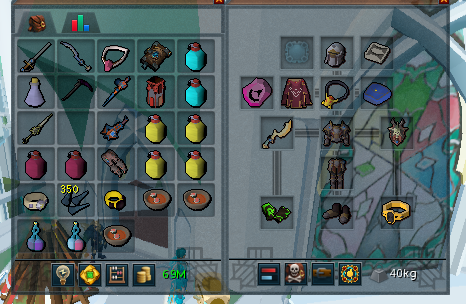 I would definitely recommend Crackling 3 + Undead Slayer which is 4 explosive components plus 1 undead in the middle and is about 1/25 chance with 120 invention + extreme invention potion if you have access to it, but even at lower levels undead slayer + demon slayer or genocidal is very easy to get with 2+ undead components. 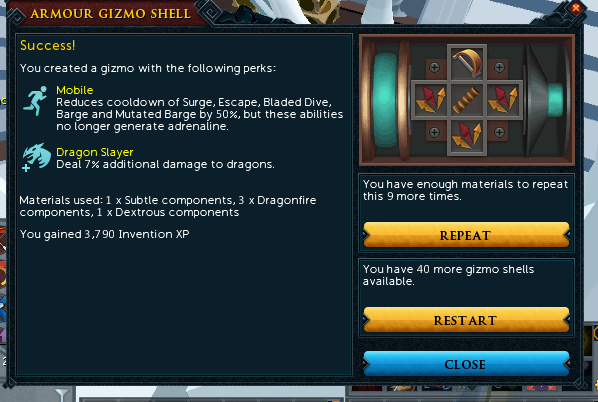 I also put a dragon slayer + mobile perk on my elite tectonic legs for use at ED2 which I found to be about 1/3 at 120 invention + extreme potion. Here is the combo: 1 subtle, 1 dextrous, 3 dragonfire. I have an impatient 3 + devoted 2 combo on my top which I find totally adequate for ED content - don't really need enhanced devoted. (I bring a melee leg switch because I have Enhanced Devoted 3 on my TMW for Hardmode Vorago, so I don't have enough slots). In terms of food, you could probably swap out the Saradomin Brews for Jellyfish, but my team likes to be cautious and ensure we never have to bank from start to finish and if something goes poorly having a ton of food can help. I haven't done a lot of solo content, but I suspect it might require lots of banking if on titan or use of a yak for most people. As usual, the mobile perk with bladed dive really shines here. Surge, bladed dive, and barge your way through the dungeon until you get to the first boss - the Crassian Leviathan. Ironically, in my first blind run through the dungeon, this is the only boss where our team died - we died 4-5 times before figuring it out. The boss essentially has three mechanics to worry about. First - the heads on either side of the room fill all but the northern end or southern end with poison gas that stuns and damages you, forcing the team to the far northern part of the room. Second - the boss very quickly does a poison breath very similar to the Queen Black Dragon superhot flames, which absolutely annihilate you - very rapid 5ks - if you're standing with a cone-like radius. Simply stand towards the side of the fight - halberd range works - to avoid. Third - the boss will tilt its head to the left or right and do a sweeping mechanic with very rapid damage from one East to West (or vice versa depending on what side it starts) and then the same thing the opposite way. At first, this will feel impossible to dodge and you may take a lot of damage - using reflect and debilitate will reduce damage from rapid 4ks to rapid 2ks enabling you to likely out eat it. Once you're used to it however, it becomes extremely easy to dodge without requiring bladed dive or surge to avoid, simply move to the right when it moves its head left, then run back the other direction. After this, you should be able to finish it off, if not, it will move to the opposite side of the arena. Simply anticipate to not get stunned by the green poison in the middle and repeat the exact same set of mechanics on the opposite side. It repeats the cycle back and forth until it dies. Taraket the Necromancer is the second boss, and since he is undead put on your salve amulets and undead slayer leg switches if you brought them. This boss is all about DPS. If you're able to phase it quickly enough, it skips the portal spawning mechanic - similar to the Sliske minigame portal that spawns lots of undead creatures and heals him if you don't kill it before the timer ends. It also spawns two giant zombies from the Dimension of the Damned content which hit fairly consistently with melee but should be ignored in favor of focusing on DPS. While the boss is healing, it's best to focus on building up adrenaline - even using abilities like natural instinct - to unload damage when it's attackable again. If your team's damage is low that's totally fine, just make sure to kill all of the portals and minions it spawns to prevent it from healing. The final attack is a wave of ghosts that can deal 9k melee damage, but these can be easily avoided by running away or surging (if your DPS is high enough you'll kill it too fast for these to hit you). We killed the boss absolutely blind on our first attempt, and it's probably a bit less punishing, but certainly more challenging, than the leviathan. The Ambassador is the final challenge and by far the most difficult. It has a lot of mechanics that require you to deal with them or suffer damage that is functionally an instant kill. Fortunately, with a bit of practice they're relatively easy to deal with and my team actually managed to get the kill second attempt without knowing any mechanics. The bosses auto attacks deal ranged damage, but at the start of the fight and every so often after he will fire a blue ball of magic energy that hits 5k in an AoE, so don't stand next to other players when they get this attack. You can resonance this attack for a big hp gain or simply pray magic to have it deal less damage. The second mechanic is a bomb with a blue timer above your head, simply deposit the bomb at the edge of the arena so nobody runs into it then get back to the fight. I typically escape when the timer is very low, wait 2 ticks for it to explode, then barge or bladed dive back in. The third mechanic are black holes that spawn on the ground - each must be stunned for it to be dismissed, or they explode for a double 8k hit for each one remaining. It's one black hole per person so try to have at least one stun off cooldown. The next attack happens at 650k hp, where he will spawn 6 fragments across the room and launch 3 walls of fire in a spiral that rotate clockwise and deal rapid 7ks. The team needs to stand in the north east corner - head there at about 625k hp so you aren't cleared by the fire. Make sure to kill all the fragments - use ultimate's like berserk and metamorphosis if needed, as for each fragment that isn't killed ambassador will charge a bomb that deals around 7-8k damage which is annoying to deal with - defensives work fine to survive these but they will slow you down. After dealing with the fragment bombs, if any, the order of the special attacks simply repeats until he spawns a bunch of crassian minions. These can't be damaged, and will be dealt with before he enters the final phase - I won't spoil how they die because it's a really cool piece of lore. At the start of the final phase, your screen will turn colors to reddish and healing pillars will start healing him, making the last part a DPS race vs the healers. The blue magic bomb from the first phase happens again, so watch out for that. The thing to watch out for is after a certain amount of time, your screen turns into those weird colors again and there will be a chat box message saying "team member, it's time for you to fall" or something like that. Ambassador targets that player for extremely rapid 7-8k magic hits which are hard to out eat even with reflect. I would highly recommend praying magic and using devotion to null this damage. After you out-dps the healers, the boss fight is over. Overall, I absolutely loved the ambassador mechanics, and I'll get over them removing the ability to phase it with high dps. To quote The RS Guy, "What a boss fight! What a boss fight!" I think it's the best designed of the three in terms of fun and enjoyable mechanics. Unfortunately, the reward is so incredibly low that I don't think many will be doing it aside from pet-hunters after a week or so. Even if each crossbow piece is 1B - which would be absolutely absurd given at best it's a minor improvement over other t92s which are around 1-1.1b at their high points in the market - the solo rate is supposedly 1/300 per piece. Even if you were incredibly efficient and got 3 solo dungeons an hour, it's still nowhere close to other t92 dropping bosses in terms of profit and is far more grind-y. I absolutely love the general direction of Elite Dungeons, but I think making mid to mid-high level content a source of best in slot weapons is a big mistake. If you want to see a full run with efficient casual strategies - no banking, low resource cost, relatively quick - here's a link to a recording of me performing the melee role (trigger warning: minimum detail). Also slow ambassador because one of our team members forgot to overload.